You need to rent a VPS with EasyEngine installed on it. Here's the list. Running this CLI will output several questions on your terminal. Each question comes with an example value enclose with square brackets . Just fill up the answers and you'll be able to automate bits of the complete migration process. Yes, I get that. This script is quite opinionated and in the beta stage. While I have released v1.0.0 it still needs to be tested and I plan to maintain and grow it. If you are wondering how it works, here's a step by step guide. Take a backup of your cPanel. I prefer taking a complete backup and that's how this script works. It's time to run the CEM CLI. Log in to your VPS via SSH. Step #5: What you need to know! 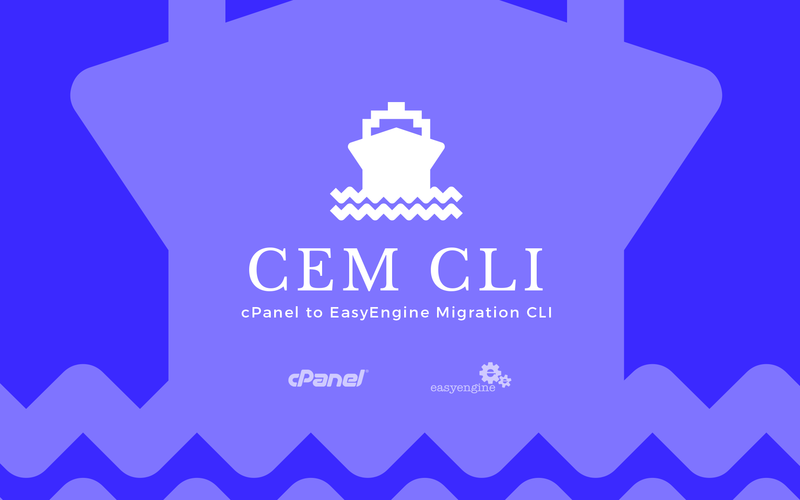 After that CEM CLI runs EasyEngine to install your site from the scratch (You need to edit EasyEngine's configuration file to make sure EasyEngine should ask you for entering the Database Name, Database Username, Database Password, and Database Prefix. You should enter all of these values similar to what you have in your wp-config.php on your old server. This is a crucial step. Otherwise, you won't be able to import your old database). After that it uses rsync to copy/sync your WP Site's files from your backup to the EasyEngine site install location i.e. from sitefolder/backup/homedir/public_html/ to /var/www/domain.com/htdocs/. You can either try to guess how it's done with the GIF below or Watch a 2 min video on YouTube. What Does Future Hold for CEM CLI?